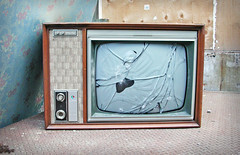 Phyl's Blog: TV - THE WORST INVENTION? You all know we've been building a new kitchen in our back room for about 5 years - OK so maybe it is just one and I'm having a sleep-deprived day. I am not sure I have ever mentioned the fate of our old kitchen. Being a room with a fairly small window, unlike our living room which has two conservatory-sized windows, we decided it would be a much better room for the TV. At the moment we can barely see the screen because of the large south-facing windows (well on that annual sunny day anyway). But I am not 100% sure that is the best idea. Well, we've bought beautiful sea blue wall paper that I really like. We've also bought solid wood flooring which is just beautiful, especially in comparison with the hideous carpet and boring cream walls in our current living room. What I started to say was. I don't watch TV. I would average my TV viewing at about 30 minutes a week max, so why make the TV room the cosiest in the house, so my big son disappears happily into his new room while all of us who are indifferent to TV (Thomas, Charlotte and I) sit in the room with the horrible carpet and drab decor?